After eight surreal courses and their equally inventive cocktails, I wasn't sure how, or even if, chef Grant Achatz could top himself with dessert. 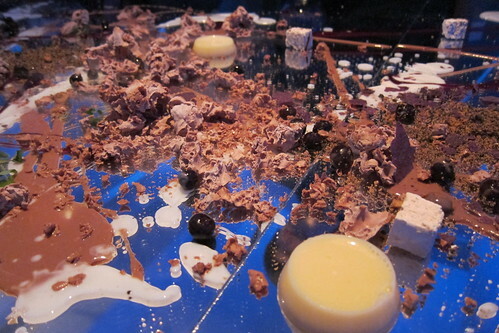 It turns out the dessert was his pièce de résistance, the most elaborate and interactive dish of the evening -- and the most fun since we got to watch him prepare it. It began with waiters requesting that we all stand back from the table. 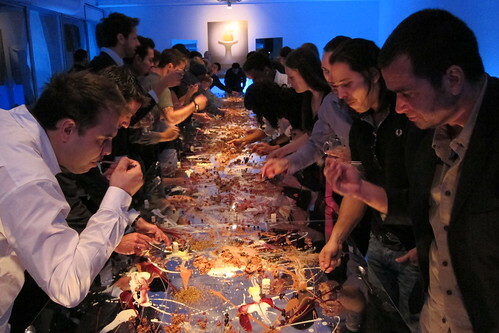 As we mingled and sipped Absolut's version of a Tom & Jerry (made with Absolut Vanilla, Averna, Amaro Abano and coffee aroma), nearly a dozen waiters cleared the long, 50-person mirrored table that ran the length of the room. They pushed back the chairs and began wiping the table with precise circular strokes. 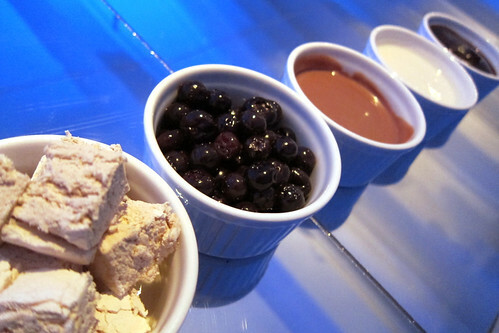 Momentarily, they laid out dishes of mise en place: chocolate flakes, freeze-dried nougat, blueberries, chocolate sauce, cream, honey and custard. 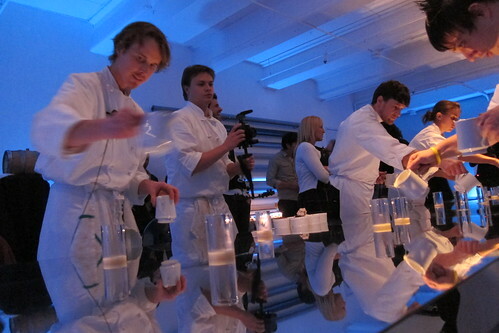 Then Achatz came out of the kitchen followed by his retinue of chefs and servers. 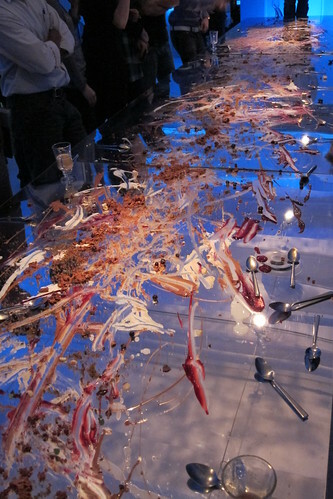 He chose his first ingredient and went down the table artfully drizzling it on the table's mirrored veneer, as his assistants followed his lead. 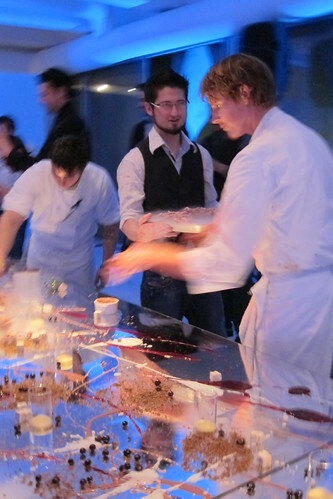 Like Jackson Pollack if he'd had a pot de crème instead of a pot of paint, Achatz and his staff went up and down the table, layering each ingredient, creating a chiaroscuro of creamy sauces against crumbled cookies. 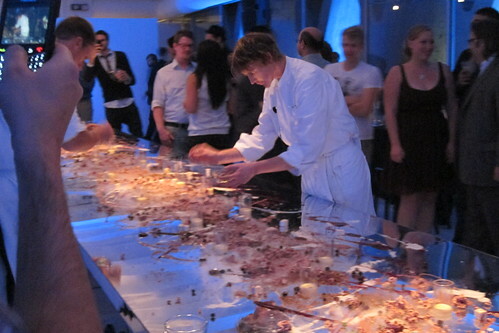 Achatz says he deliberately places some ingredients farther away from people, so they are forced to interact with their fellow diners as they reach across them for a freeze-dried chunk of nougat or a drizzle of dark chocolate. For the staff this seems like a complicated but efficiently choreographed dance that allows everyone, not just the chef, to show some creativity. 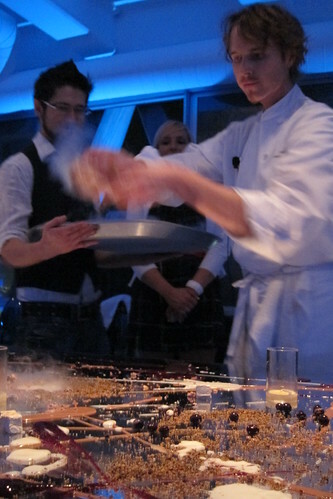 Grant Achatz and Craig, one of his assistant chefs, add the liquid nitrogen for a dramatic footnote. 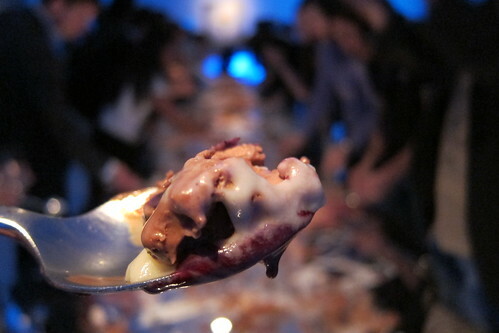 Everyone gets a spoon and eats the shared dessert right off the table. After the controlled savagery of the dessert, the aftermath.